Description: This tutorial teaches FIWARE users about batch commands and entity relationships. The tutorial builds on the data created in the previous store finder example and creates and associates a series of related data entities to create a simple stock management system. The tutorial uses cUrl commands throughout, but is also available as Postman documentation. Within the FIWARE platform, the context of an entity represents the state of a physical or conceptural object which exists in the real world. As you can see, each of the entities defined above contain some properties which are liable to change. A product could change its price, stock could be sold and the shelf count of stock could be reduced and so on. 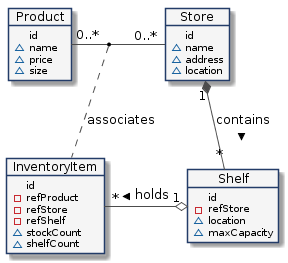 Therefore a store in the real world is represented in the context data by a Store entity, and a real world shelf found in a store is represented in the context data by a Shelf entity which has a refStore attribute. This application will only make use of one FIWARE component - the Orion Context Broker. Usage of the Orion Context Broker (with proper context data flowing through it) is sufficient for an application to qualify as “Powered by FIWARE”. Since all interactions between the two elements are initiated by HTTP requests, the entities can be containerized and run from exposed ports. Both containers are residing on the same network - the Orion Context Broker is listening on Port 1026 and MongoDB is listening on the default port 27071. Both containers are also exposing the same ports externally - this is purely for the tutorial access - so that cUrl or Postman can access them without being part of the same network. The command-line initialization should be self explanatory. This command will also import seed data from the previous Store Finder tutorial on startup. Lets create five shelf units at the same time. This request uses the convenience batch processing endpoint to create five shelf entities. Batch processing uses the /v2/op/update endpoint with a payload with two attributes - actionType=APPEND means we will overwrite existing entities if they exist whereas the entities attribute holds an array of entities we wish to update. To differenciate Shelf Entities from Store Entities, each shelf has been assigned type=Shelf. Real-world properties such as name and location have been added as properties to each shelf. Similarly, we can create a series of Product entities by using the type=Product. In both cases we have encoded each entity id according to the NGSI-LD specification - the proposal is that each id is a URN follows a standard format: urn:ngsi-ld:<entity-type>:<entity-id>. This will mean that every id in the system will be unique. Shelf information can be requested by making a GET request on the /v2/entities endpoint. For example to return the context data of the Shelf entity with the id=urn:ngsi-ld:Shelf:unit001. In databases, foreign keys are often used to designate a one-to-many relationship - for example every shelf is found in a single store and a single store can hold many shelving units. In order to remember this information we need to add an association relationship similar to a foreign key. Batch processing can again be used to amend the existing the Shelf entities to add a refStore attribute holding the relationship to each store. According to the FIWARE Data Modelling Guidelines on linked data, when an entity attribute is used as a link to other entities it should be named with the prefix ref plus the name of the target (linked) entity type. The value of the refStore attribute corresponds to a URN associated to a Store entity itself. Now when the shelf information is requested again, the response has changed and includes a new property refStore, which has been added in the previous step. This can be interpreted as "I am related to the Store entity with the id=urn:ngsi-ld:Store:001"
This request is asking for the id of all Shelf entities associated to the URN urn:ngsi-ld:Store:001, the response is a JSON array as shown. Can be interpreted as request for Give me the names of all shelves in urn:ngsi-ld:Store:001. Bridge Tables are often used to relate many-to-many relationships. For example, every store will sell a different range of products, and each product is sold in many different stores. In order to hold the context information to "place a product onto a shelf in a given store" we will need to create a new data entity InventoryItem which exists to associate data from other entities. It has a foreign key relationship to the Store, Shelf and Product entities and therefore requires relationship attributes called refStore, refShelf and refProduct. When reading from a bridge table entity, the type of the entity must be known. Context data relationships should only be set up and maintained between entities that exist - in other words the URN urn:ngsi-ld:<entity-type>:<entity-id> should link to another existing entity within the context. Therefore we must take care when deleting an entity that no dangling references remain. Imagine urn:ngsi-ld:Store:001 is deleted - what should happen to the associated the Shelf entities? The response lists a series of Shelf and InventoryItem entities - there are no Product entities since there is no direct relationship between product and store. If this request returns an empty array, the entity has no associates.